← Everything You Wanted to Know About Colony Collapse Disorder. 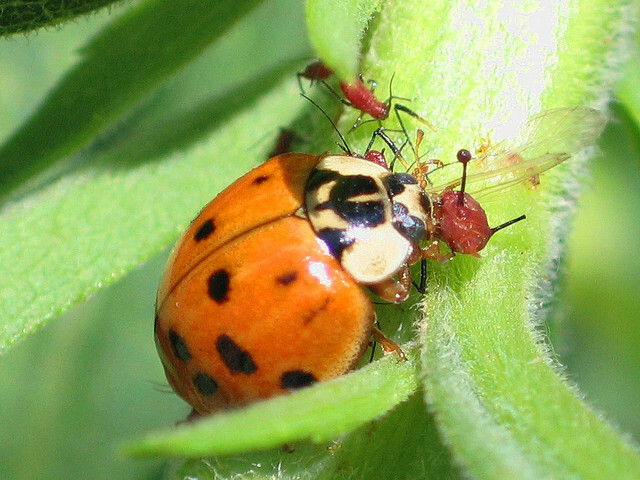 Birds, Cows, Hens, and Bugs – Things the Ladybug is Not: Why Are Ladybugs Called Ladybugs? One of the questions that I’ve seen on Twitter and on Instagram is why is the ladybug called a “ladybug” or a “ladybird” if you’re in the UK. These names are especially confusing because it’s obviously not a bird but more confusingly is not a “bug” either. It’s a beetle, in the family Coccinellidae. Seriously – who’s responsible for this? But to answer this question we have to go back to the middle ages in Europe where the term “Ladybird” was first used. Legend has it, that the farmers during this period were plagued with aphids. While aphids aren’t as grandiose and awe inspiring as locusts, they can do quite a bit of damage to plants. The farmers, not knowing what else to do, prayed to the Virgin Mary for help. Shortly after doing so, a swarm of ladybugs appeared on the horizon and gobbled up all of the pesky aphids. The farmers, called their saviors “Our Lady’s Bird” referring to the Virgin Mary. Apparently they were not well versed in the differences between insects and birds though. The most common ladybug in Europe is the Seven-Spot Ladybird (Coccinella septempunctata) which is a beautiful red color with seven spots. 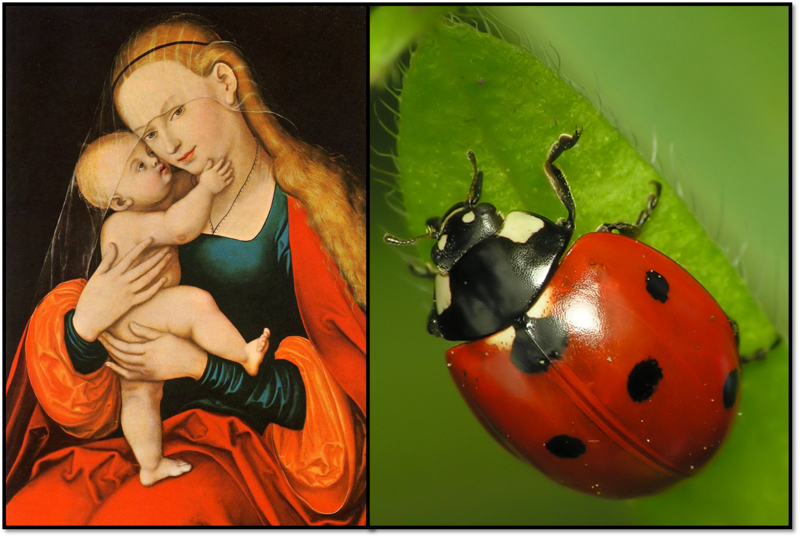 Since early depictions of Mary often show her with a red cloak, the ladybug was further associated with her. The seven spots on its back are through to represent her seven joys and seven sorrows. Left: Mary and Jesus (Passauer Gnadenbild 1517-1525). Public Domain. Fast forward a couple hundred years and the British colonized America. 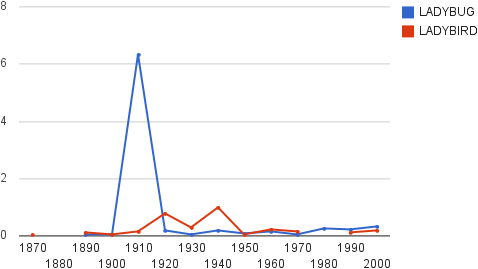 In the United States we kept using the word “Ladybird” until “Ladybug” made it’s appearance in the early 1900’s. In German, ladybugs are called “Marienkafer” which translates to “Mary’s Beetle”. So, good job Germany for getting animal correct. In Danish it’s called “Mariehøne” which translates to “Mary’s Hen”. In Slovak it’s called “Lienka” which doesn’t have a direct translation. However, it’s sometimes called “Panbozkova Kravicka” which translates to “Lord God’s Little Cow”. This might seem strange, but a lesser known English common name is “Lady Cow”. Okay, it’s still strange. Just a strange that showed up in two languages. In Korean , it’s called 무당벌레 (Mudang buhl-eh,무당- witch doctor; 벌레- insect). This is because the traditional witch doctors would wear colorful robes when preforming the rituals. Therefore, the beetle’s coloration was reminiscent of the colorful clothing worn by the witch doctors. The family name “Coccinellidae” comes from the Latin “Coccineus” which means “Scarlet.” At least scientists are reliably boring and accurate. 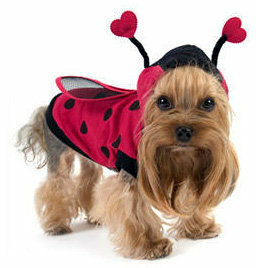 If you want to contribute to the random assortment of animals that the ladybug has been associated with, you can always dress you dog up for Halloween. You can wow everyone with your Ladydog. You can buy this here. I don’t speak any of the aforementioned languages (sometimes English is hard for me…) so if you have further insight or want to add what ladybugs are called in other languages that you speak, comment below! This entry was posted in Culture, Taxonomy and tagged Coccinellidae, Lady Beetle, Ladybird, Ladybug, Mary, why are ladybugs called ladybugs. Bookmark the permalink. 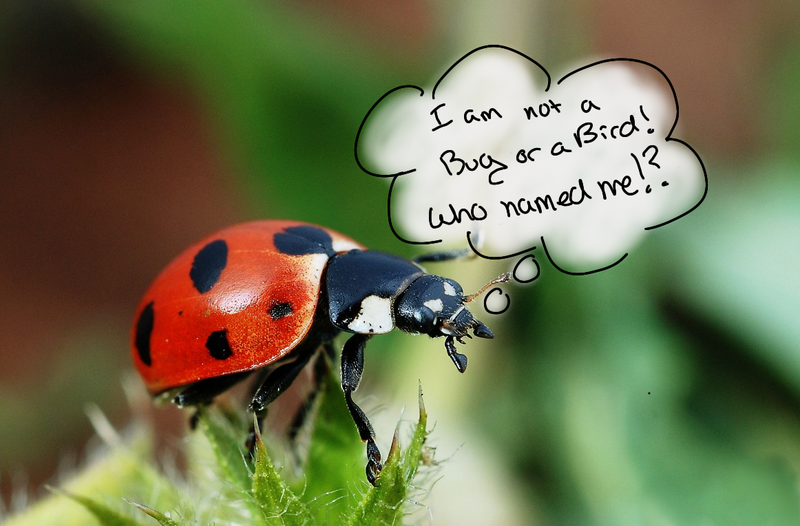 9 Responses to Birds, Cows, Hens, and Bugs – Things the Ladybug is Not: Why Are Ladybugs Called Ladybugs? Names can be very convoluted. We have a bird called a Robin. It has a red breast and used to be called a Redbreast. Then it acquired the alliterative prefix Robin Redbreast. Now it’s just a Robin. P.s. I love your blogs. Indeed! At least with birds the English common names are standard. With insects it’s crazy and terrible. Like in GA we have “Red bugs” [Chiggers] and in NY we also have “Red bugs” [Myrids] which are pests on apples. When I first got to Georgia and everyone was telling me to watch out for the chiggers I was super confused haha. 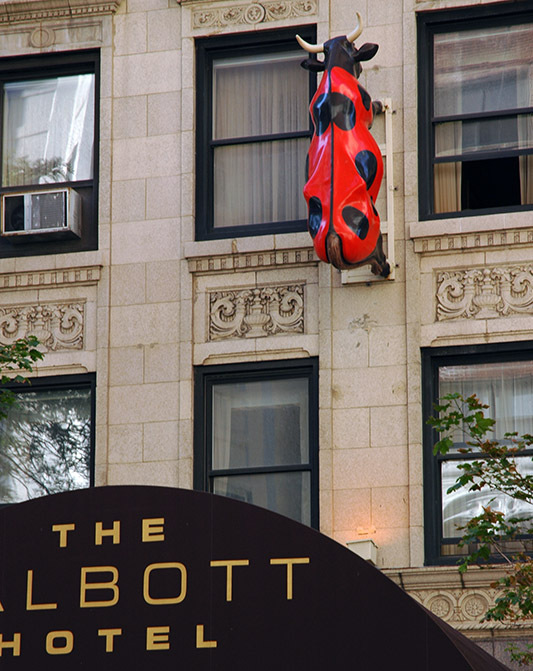 Seems like a daily holy beetle or holy cow beetle. Interesting will look up in Spanish too but haven’t seen any in our part of Spain…maybe yet. Thanks for that. I will be looking out more for all insects. In French it’s “coccinelle”, which has the same origin as Coccinellidae. They’re sometimes called “bête à bon Dieu” which translates to ‘good God’s beast’.